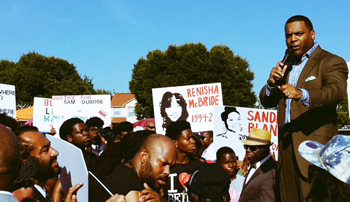 HEMPSTEAD, Texas – Nearly a month after the death of Sandra Bland in police custody, there have been countless rallies, marches and protests demanding answers and justice for what many believe to be a murder made to appear as a suicide. 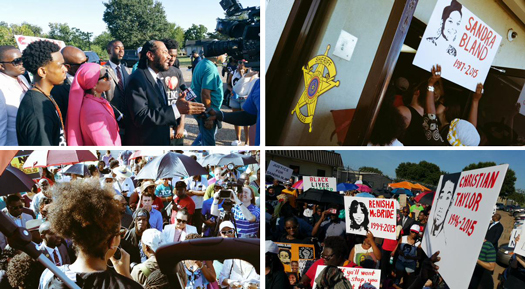 On August 9 — which also marked one year after the murder of Michael Brown, Jr., in Ferguson, Mo., by police officer Darrin Wilson — nearly 300 people gathered at the Waller County Jail to demand justice and answers for what really happened to Ms. Bland. Among the speakers were protest organizers Secunda Joseph and Brandi Holmes as well as Congressman Al Green (D-9th), community activist Deric Muhammad, pastor Eddie Andre Deckard, and Prairie View A&M University student and Nation of Islam Student Association president Rasheedah Muhammad. 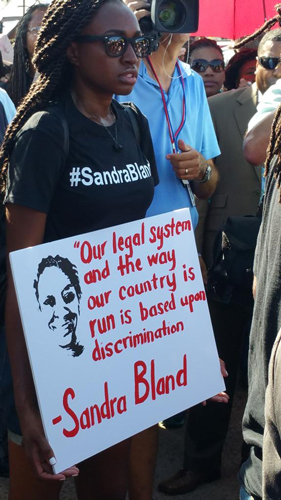 After marching around the jail, the swelling crowd crushed through the front doors, overwhelming the entire building foyer while chanting and raising their fists to demand justice for Sandra Bland and others. Although this day of remembrance and response was a peaceful protest, it was a bold demonstration of what putting aside titles, labels, gender, race and class could produce in sending a much needed message. Where are the concrete programs to address Black on Black violence?